One of the best complexes in the Seagrove Beach area away from 30A traffic and near to everything especially the beach. Our “Endless Summer” condo is on the ground floor and less than 100 yards from the sugar white beach and emerald waters. You can see the gulf from the living room, the deck and even the kitchen (in the mirrored wall) as well as the pretty dunes. This complex is in its own little area away from busy 30 A as this complex is nestled in a place where 30A retreats back from the beach to allow a local traffic only area with very few cars. Our condo is ground floor with 2 Bedroom and 2 Bath and just steps from the large pool, 2 tennis courts and of course the beach. We added 3 Flat Screen Large TVs, Stainless Steel appliances, New Beds, new furniture and many, many extras. You enter the condo just steps from many parking spots just behind the breezeway. Beach access is straight out your door and only steps away. The pool is even closer as well as the Tennis courts. We have flat screen LCD TVs , 42 inches in the living room, a 42-inch in the master bedroom and a 32-inch in the 2nd bedroom all wall mounted. We have all stainless steel appliances and a lot of special amenities that others just don’t offer as standard, such as a “Pack and Play”, Highchair, DVD player and movies just to name just a few. Bring your laptop and use our free wireless internet service. We know that many of you are coming from far away and can’t pack all the things you would like to make your family`s stay easy and fulfilling. We have listened to our renters and we offer as much as reasonably possible when you rent with us. The condo has a master suite with King-size bed and private bath and walk in closet with ceiling fan. The second bedroom has a twin bunk bed setup along with a queen bed and there is even a pull-out sleeper sofa in the living room that sleeps two. Fully-equipped kitchen. Stylish tile floor throughout the kitchen living area and bathrooms. A charcoal grill is located just outside the unit for you convenient access. On the private patio just in front of living room are some nice chairs and decorative table. Sit on the patio and listen to surf and look at the dunes and the peak of the Gulf or walk down to the beach to watch some of the most beautiful sunsets you`ve ever seen. Convenient parking is available just behind the unit. Here you’ll find an outdoor shower –the perfect place to rinse and cool off before coming inside. Beachside Villas is a clean and well maintained complex with excellent manicured landscaping including seasonal flowers and over 100 palm trees. The Complex has two well maintained and fully updated swimming pools (one seasonally heated) with fresh deck surfaces, two lighted tennis courts, shuffleboard, a club house and many charcoal BBQ grills in convenient areas near each building. An abundance of recreational activities are available in Seagrove Beach such as swimming, sandcastle building, surfing, snorkeling, canoeing, kayaking, picnicking, fishing, boating, sunning and swimming with dolphins often nearby in the Gulf. Eastern and Deer Lakes are on either side of the Beachside Villas development and provide shallow wading areas for the kids where the lakes break-out to the beach. For land lovers, non-beach activities include golf, tennis and nearby hiking and biking trails along 17 miles of the dedicated continuous bike paths that parallel picturesque highway 30-A. Up and down the road from Seagrove Beach are antique stores, art galleries, unique shops, and award winning restaurants. Spend time exploring the other nearby beach communities, including neighboring Grayton Beach, Rosemary Beach and famous Seaside (5 minutes away), site of the Jim Carrey movie, “The Truman Show.” For a vacation that is pure Florida, away from the crowds of the amusement parks, but still close enough for a quick trip to them, Seagrove Beach could be the answer to your dreams. WaterColor and Seaside are just 3 miles to the west, while Alys and Rosemary Beaches are 4 and 5 miles to the east, respectively. Need to do some shopping? Take in an afternoon at the spectacular Pier Park, a mega outdoor shopping mall with more than a million square feet of specialty shops, restaurants and a movie theater in Panama City, just 15 miles east on Highway 98. For those that may want water parks, outlet malls, deep sea fishing and water skiing, they are all close and convenient at both Panama City Beach and Destin which are both only approx. 20-25 minutes away either way east or west from Seagrove Beach. Bedding: This unit is designed to sleep 6 people comfortably. o Master Bedroom: King Bed with new mattress. o 2nd Bedroom: Bunk beds with a queen Bed. excellent - Tanya was great - excellent service and communication from the start to end. The entire experience from beginning to end was simple, clear, and we had a nice stay. No hassles, everything is done ahead of time, one call to make sure we are happy, just a very easy experience. 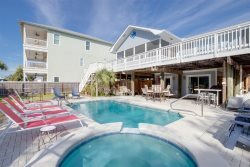 Great property, easy trip from Birmingham; my family has been staying here for over 10 years, very quiet part of the beach, but still very close to either Destin or Panama City. Highly recommend Myer Properties. Fantastic team! Highly professional and personalized staff that made sure we had a great vacation stay! Great condo with updated amenities and comfy bed. The kitchen was well stocked and a good layout. Cant beat the location! Myer Properties was fabulous to work with. They were very friendly and willing to go out of their way to get any questions answered. They worked with me to ensure there was a pack and play and a high chair in the unit, and went the extra mile to verify that we would have everything we needed when we arrived. They contacted us shortly after checking in to make sure that we arrived and everything was as it should be. We appreciated having a number we could call if there were any problems. We had a fabulous vacation! The condo we rented was exactly what we thought we were getting. The condo was clean and had everything we needed. We appreciated having plenty of towels. We had a wonderful time at your property. The beach was beautiful and it was centrally located for our various outings. We also used the tennis courts and swam in the pool. The check-in and check out went very smoothly. It was a great place to stay with 3 teenage girls. The condo we stayed in was great. We loved the tropical decor and all the amenities that came with it. We will definitely try to return again next time we are in the area. Everyone was responsive and helpful. Jon and Reba are great, they always provide a great experience, easy to deal with, and everything is always top level at a great price.